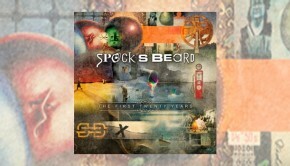 Spock’s Beard are back with the 12th album of their 20 year career, following 2013’s Brief Nocturnes and Dreamless Sleep. This release is available in all listening formats; standard CD, Media Book CD with bonus track, 180g Gatefold 2LP vinyl (my personal favourite way to listen) – in a package that includes the CD – and a digital download which forms the basis of this review. Unfortunately the bonus track, Iron Man, is not included. 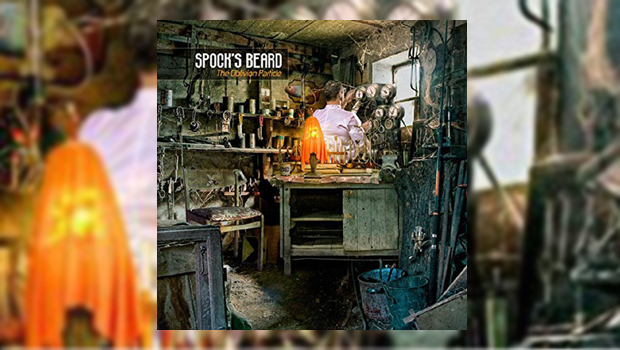 I must confess here that I have not paid much attention to the Spock’s since 2010’s X, an album that I purchased but did not play more than a couple of times, so I was unaware of the direction of their last album as it completely passed me by. 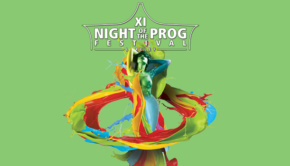 The Oblivion Particle continues with the band line-up found on Brief Nocturnes and Dreamless Sleep, and although clocking in at over 66 minutes it’s long but does not appear to outstay its welcome. This is partly due to the quality and variety of the songwriting throughout. The two members who joined after X feature heavily on this release; Ted Leonard’s vocals soar throughout and suit the Spock’s style while Jimmy Keegan’s drumming is of a high quality and holds the songs together well. In fact all members have made excellent contributions here, from Ryo Okumoto’s amazing keyboards through Dave Meros’ powerful and prominent bass to Alan Morse’s great guitar work utilizing a variety of different instruments. The opening track, Tides of Time is firmly in classic Spock’s Beard territory, you know from the off who this is, but that said, this is probably true for most of the songs here as they have stretched themselves whilst still holding true to their signature sound. Minion has a slightly harder edge, one that appears occasionally throughout the album, but in my opinion does not overload the songs. Get Out While You Can starts with a slow build, to my ears a little reminiscent of Primus, then changes as the keyboards enter and begin to swirl around the song before it moves into the Spock’s sound that they do so well. Bennett Built a Time Machine describes just that in a somewhat light-hearted look at someone trying to change his life. We get a gentle start that at times sounds like McGuiness Flint from the 70’s to these ageing ears, the song changing when the vocals come in. At around 3 minutes the vocals fade with echo in a Pink Floyd way before the tempo begins to pick up, great bass work from Meros leading into an instrumental passage before the return of Ted’s voice for the finale. The Center Line opens with piano giving a classical feel, another change in tempo and it becomes more rock styled. The longest song here, To Be Free Again, clocks in at over 10 minutes and is another accomplished tune, both dramatic and epic with some great playing, including quality guitar work towards the end. The album closes with Disappear featuring a guest appearance from Kansas violinist David Ragsdale who adds some lovely textures. It’s an unusual song to end with as it is almost ballad-like for the first few minutes before changing pace. Ragsdale offers an excellent solo, supported by vocal harmonies that would not be out of place in Yes, and Alan takes us towards the end with more fine soloing. Overall this is an enjoyable album which appears to improve with repeated plays, each time revealing something new. 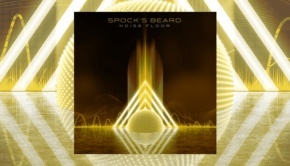 Definitely a Spock’s Beard album, their sound is all over it but there is an indication that this new line-up may have found their stride and are prepared to take some risks, which can’t be a bad thing.